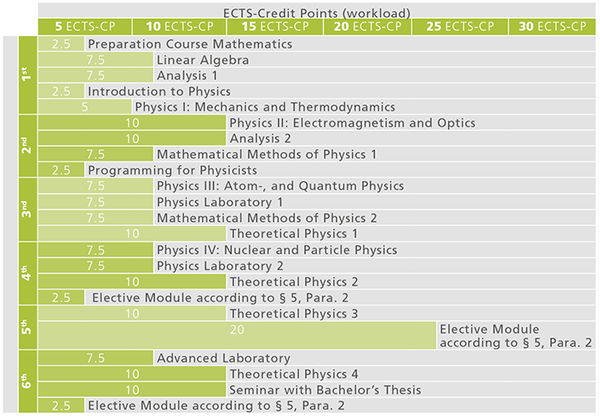 VO Introduction to Physics (CM 5/ 1h./2.5 ECTS-Credits). (2) Successful passing of all exams of the Studies Induction and Orientation Stage entitles to passing all further courses and examinations as well as to writing the Bachelor’s Thesis. (3) Before successful completion of the Studies Induction and Orientation Stage courses amounting to 21.5 ECTS-Credits may be passed. The requirements specified in the curriculum must be met. The Bachelor’s Programme Physics prepares graduates for occupational opportunities as physicists in industry and economy, and for the Master’s Programme Physics. The bachelor’s programme gives an overview of the fundamental principles of the different disciplines in the field of physics, and it offers a wide range of elective modules. Graduates are able to analyze and solve physical issues in natural science, engineering, economy, medicine, and other fields. the ability to work in a team as well as to present and document results. Graduates possess scientifically well-founded theoretical and methodical problem-solving skills in order to apply technical issues in natural science, engineering, economy, medicine and economy in interdisciplinary contexts. The training in basic and research-oriented teaching in the fields of experimental and theoretical physics enables graduates to make knowledge-based solutions on creative approaches. Graduates of the Bachelor’s Programme Physics are in demand in the fields of natural science and engineering, as well as in industry and research. In particular, by their ability to provide independent problem solutions, they are characterized for a wide range of career fields.